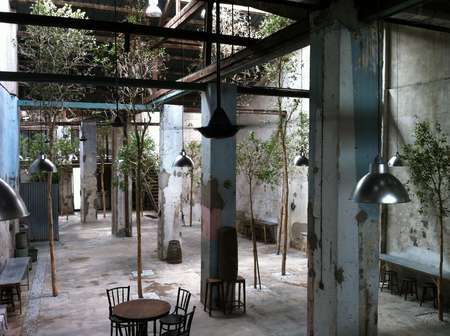 while cafe and theatre on ground floor. Diagram 2: Interior of Penang Sekeping Victoria designed by Ng Seksan. Penang is where we can obviously see government takes part in pushing art to public. The appears of street mural effectively attract tourists to visit the old heritage city. Private sectors are also a supportive back up for art environment in Penang, such as China House which was a redesigned traditional house, making into combination of gallery, cafe and theatre with excellent aesthetic taste. 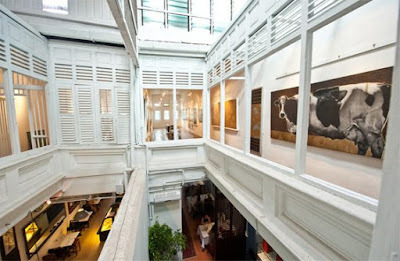 Similar to China House, Sekeping Victoria, a combination of hotel, cafe and event space in George Town that redesign from old building by the well-known architecture Ng Seksan is another place that innovate from Penang old heritage. Penang is such a town that preserve the traditional beauty yet they did not reject the new innovation. Accepting new idea is a wise choice to sustain the collective memory from past decades, and it is the most interesting point for tourist attraction because it shows the character of Malaysia. For Penang people that grow in rich art environment, are they more art educated? Art gallery is more saturated in Kuala Lumpur compared to other states in Malaysia, especially in fine arts. For instance, National Visual Arts Gallery is a place where shows government pay attention to Malaysian art education. It is constantly renovating following the changes of era. Art gallery is different to Penang's street art and cafe that people pass by or walk in everyday, for common people, art gallery is where visitors need to be serious, dress well and think deeply. The Art Expo Malaysia founder's original goal described from their official website is to "having an art fair to bring together some of the finest artworks from different parts of the world to Kuala Lumpur, for public viewing". He is hoping public to appreciate the collection that he brought in, so that it helps the growth of art industry in Malaysia. But does public really have the sense to appreciate them? Kuala Lumpur has numerous number of street art and cafe too, yet it has more art galleries and exhibitions. Datuk Vincent Sim paid so much amount of workloads to bring in the art pieces for public, does it make any difference to Kuala Lumpur? Or perhaps make any improvement for Malaysian visual art education? Or it just provide people to check-in on Instagram? Is Organising Art Exhibition Effective in Public Art Education? Art scene in Malaysia is growing together with the blooming of art and design market. The enthusiasts really create stuff and make it into a small scale business for just for sharing. It has became a trend among young people too. Besides, cafe that well designed also improved people's sense toward environment and atmosphere. It open a space for them to appreciate art, and then goes upward to fine art. In appreciating art, the first layer is to see the presentation of art piece, then understand the meaning or content behind it. A person with born visual taste is able to recognise or feel the beauty of artwork's appearance, but the one without visual art sense need to learn it, not to mention analysing artwork's content that definitely require to think. Malaysian need a proper art education in appreciating art that taken seriously, not just the Visual Art subject in primary or secondary school that sometimes "borrowed period" for other "more important" subjects. I have the ideas on this issue, now I need to find a theory to prove my thinking, content is probably about art education.